This PMR study offers a ten-year analysis and forecast for the global electronic grade phosphoric acid market for the period between 2018 and 2028. The study considers 2017 as the base year with market values estimated for 2017 and a forecast developed for the duration between 2018 and 2028. The Compound Annual Growth Rate (CAGR) has been calculated from 2018 to 2028. The study covers various perspectives of the electronic grade phosphoric acid market, including market dynamics, value chain, pricing analysis, competition analysis, regional and segmental growth comparison and macro-economic and industry growth analysis, along with segment-level projections in a comprehensive manner. As per the findings of the study and perspectives of industry participants, the global electronic grade phosphoric acid market is projected to grow at a CAGR of 7.8% between 2018 and 2028, in terms of value. Fast-paced production of consumer electronics and the trend of miniaturization of electronic components are some of the factors positively impacting the consumption of electronic grade phosphoric acid in the global market. The PMR report on the electronic grade phosphoric acid market carefully analyses the market at a global and regional level through market segmentation on the basis of key parameters, such as grade and application. The primary objective of the electronic grade phosphoric acid market report is to offer key insights on market updates, competition positioning, current trends, market potential, growth rates and other relevant information and statistics in a suitable manner to the readers or various stakeholders of the market. Electronic-grade phosphoric acid, also known as ortho-phosphoric acid, is high-purity phosphoric acid mainly used in the electronics and microelectronics industry for the manufacturing of semiconductors, thin film LCD panels, large-scale integrated circuits such as VLSI and ULSI. Mainly serving as cleaners and etchants, electronic grade phosphoric acids are used in wafer etching and chip cleaning applications. Its acidic characteristics impart cleanliness to the metal part, washing off the impurities present. The report is structured in such a way that it will allow the reader to develop a thorough understanding of the electronic grade phosphoric acid market. It begins with market definitions, followed by the market background, market dynamics and market analysis by key segments, regional analysis and competition landscape. Each section covers a qualitative and quantitative assessment of the electronic grade phosphoric acid market on the basis of facts, historical developments and key opinions collected from industry participants through dedicated interviews and trends in the market. The report begins with market introduction, which covers the market taxonomy and product definitions for the global electronic grade phosphoric acid market assessment. In the next section, the report describes the market development background and covers macro-economic factors, industry factors, forecast factors, regional weighted average pricing analysis, value chain overview covering approximate margins, an indicative list of stakeholders involved in each stage and an assessment of the electronic grade phosphoric acid market for the base year considered for the study. The next section of the electronic grade phosphoric acid market report discusses market dynamics, such as drivers, restraints and trends, impacting the market growth at a global level. Market opportunities for manufacturers have been presented in the subsequent section of the same chapter. This section also includes the impact assessment of market dynamics on the global electronic grade phosphoric acid market at a qualitative level, based on analysis facts and insights. Subsequent sections of the report provide value (US$ Mn) and volume (Kilo Tons) projections for the electronic grade phosphoric acid market on the basis of the aforementioned segments at a global level. The global market values represented in these sections have been agglomerated by collecting data and information at a regional level. The market information, along with key facts and insights, covers unique analysis frameworks, such as absolute $ opportunity analysis, year-on-year growth trend comparison, market share and attractiveness analysis, for each of the sub-types covered in each segment. The next section of the report presents a summarised view of the global electronic grade phosphoric acid market, based on six prominent regions considered in the study. The section includes the regional market position, growth potential, trends and market attractiveness analysis for each of these regions. The electronic grade phosphoric acid market analysis sections cover Y-o-Y growth trends, market share analysis, market attractiveness and incremental $ opportunity assessment for each of the aforementioned segment. These sections analyse the degree to which the global drivers are influencing the electronic grade phosphoric acid market in each region. All the above sections evaluate the present market scenario and growth prospects in the global electronic grade phosphoric acid market, while the forecast presented in the sections assess the market size in terms of volume and value. In order to offer an accurate forecast, we started by sizing the current market, which forms the basis of how the global electronic grade phosphoric acid market is expected to develop in the future. Given the characteristics of the electronic grade phosphoric acid market, we triangulated the outcome of three different types of analysis, based on primary research, secondary research and our own analysis. However, forecasting the market in terms of various segments and regions is more a matter of quantifying expectations and identifying opportunities rather than rationalising them after the completion of the forecast exercise. In addition, it is imperative to note that in an ever-fluctuating global economy, we not only conduct forecasts in terms of CAGR, but also analyse the market on the basis of key parameters, such as Year-on-Year (Y-o-Y) growth, to understand the predictability of the electronic grade phosphoric acid market and identify the right opportunities available. As previously highlighted, the electronic grade phosphoric acid market has been split into a number of sub-segments. All the electronic grade phosphoric acid sub-segments, in terms of grade, application and region, have been analysed on the basis of Basis Point Share (BPS) to understand each individual segment’s relative contribution to the market growth. This detailed level of information is important for the identification of various key trends being witnessed in the electronic grade phosphoric acid market. Another key feature of this report is the analysis of all the key segments in the electronic grade phosphoric acid market, sub-segments and the regional adoption and revenue forecast in terms of absolute dollar opportunity. This is traditionally overlooked while forecasting the market; however, the absolute dollar opportunity is critical in assessing the level of opportunity that a provider can look to achieve as well as to identify potential resources from a sales and delivery perspective in the electronic grade phosphoric acid market. In order to understand the key market segments in terms of the growth and consumption of electronic grade phosphoric acid across concerned regions, PMR has developed an attractiveness index, which will help providers identify real market opportunities. In the final section of the report, a competitive landscape of the electronic grade phosphoric acid market has been included to provide report audiences with a dashboard view, categorised on the basis of providers present in the value chain, their presence in the electronic grade phosphoric acid market and key differentiating factors and strategies. The primary category of providers covered in the report is electronic grade phosphoric acid manufacturers. This section is primarily designed to provide clients with an objective and detailed comparative assessment of the key providers specific to a market segment in the value chain of the electronic grade phosphoric acid market. Report audiences can gain segment-specific vendor insights to identify and evaluate key competitors on the basis of in-depth assessment of their capabilities and success in the electronic grade phosphoric acid Marketplace. Detailed profiles of providers have also been included under the scope of the report to evaluate their long- and short-term strategies, key offerings and recent developments pertaining to the electronic grade phosphoric acid market. Examples of some of the key competitors covered in this report include Solvay SA, Arkema S.A., OCI Company Ltd, Israel Chemicals Ltd., Cabot Microelectronics Corporation, Merck KGaA, RIN KAGAKU KOGYO Co., Ltd., Taiwan Maxwave Co., Ltd., Asia Union Electronic Chemical Corp, SEMIAC Electronic Chemicals Co., Ltd., and Avantor, Inc., among others. High – purity phosphoric acid employed in electronics and microelectronics manufacturing is known as electronic grade phosphoric acid. Electronic grade phosphoric acid is mainly used in the manufacturing of semiconductors, thin film liquid crystal display panels and large scale integrated circuits, such as VLSI and ULSI, among others. Electronic grade phosphoric acid is prominently used in wafer etching and cleaning applications. The acidic properties of electronic grade phosphoric acid wash off the impurities from the metal surface, making the metal suitable for use in the electronics industry. In terms of purity, >80% purity and <80% purity electronic grade phosphoric acids are available in the market. Historically, <80% purity electronic grade phosphoric acid was widely used, while >80% high purity electronic grade phosphoric acid is recently being adopted by end-use industries. >80% high purity electronic grade phosphoric acid finds application as an etchant and cleaning agent in the production of electronic wafers, which are further used to manufacture semiconductors. On the other hand, <80% electronic grade phosphoric acid finds prominent applications in the cleaning of liquid crystal display panels. This grade type registers high consumption, due to the vast production of LCD panels around the world. 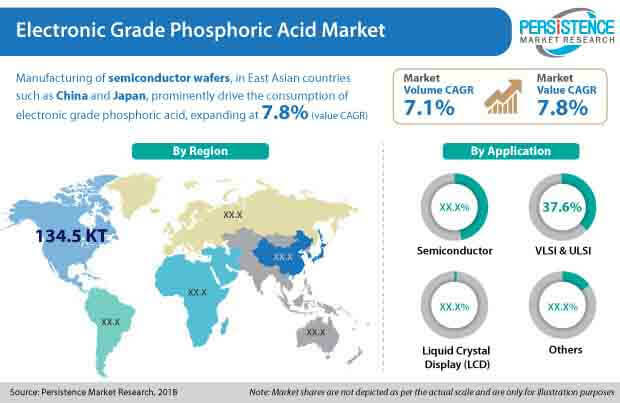 Among applications, the semiconductor segment is anticipated to account for a prominent share in the demand for electronic grade phosphoric acid. Mainly employed in cleaning applications and as an etchant, the demand for electronic grade phosphoric acid is further set to surge over the forecast period. The global market is estimated to be valued at US$ 827 Mn by the end of 2018 and is expected to reach a market value of over US$ 1.7 Bn by 2028 end, expanding at a CAGR of 7.8% over the forecast period. The global market is anticipated to represent an incremental opportunity worth US$ 930 Mn from 2018 to 2028. Electronic grade phosphoric acid is mainly employed in semiconductor manufacturing. It can also act as a dopant in PV (photovoltaic) production. Further, it finds application in the manufacturing of fuel cells and display panels such as LCD screens for computers, mobile phones and televisions. Electronic grade phosphoric acid is used in the manufacture of high-quality electronic parts & components. Regionally, countries of East Asia are prominent regions in the electronic grade phosphoric acid market, due to the significant presence of electronic parts & components manufacturing companies in the region. Technologically advanced regions such as North America and Europe collectively account for over a 35% share in the market with a rising inclination towards >80% purity electronic grade phosphoric acid. Developing countries of South Asia are anticipated to register a higher growth rate over the forecast period, due to the favorable conditions for emerging businesses and the higher ease of doing business index. The major players operating in the electronic grade phosphoric acid business vertical are focusing on adopting brownfield investment strategy in an attempt to reduce competition, enhance their market share as well as market presence. For instance, Merck KGaA acquired Sigma-Aldrich to strengthen the global reach of its products. Similarly, Avantor, Inc. acquired VWR Corporation. The backward integration business model adopted by Israel Chemicals Limited assists the company in maintaining low manufacturing costs pertaining to electronic grade phosphoric acid products. Cabot Microelectronics, too, follows a backward integrated business model in the electronic grade phosphoric acid marketplace, recently acquiring KMG Chemicals. Solvay SA has much recently ventured in the electronic grade phosphoric acid manufacturing and has been noted to adopt an organic growth strategy. Some of the players reported in the electronic grade phosphoric acid market study include Solvay SA, Arkema S.A., OCI Company Ltd, Israel Chemicals Ltd., Cabot Microelectronics Corporation, Merck KGaA, RIN KAGAKU KOGYO Co., Ltd., Taiwan Maxwave Co., Ltd., Asia Union Electronic Chemical Corp, SEMIAC Electronic Chemicals Co., Ltd., and Avantor, Inc., among others.